Face masks can help the skin in so many different ways, especially if you are using them on a regular basis. However, did you know that there is a way in which you can get even more out of your face masks? This is all thanks to multi-masking, a technique that is becoming increasingly popular all over the world. Face masks are usually designed to be applied all over the face, giving each part of your skin its benefits. For example, the skin around your eyes is ten times thinner than the rest of your face, meaning that this area not only needs more protection, but will also likely require anti-aging ingredients sooner than the rest of your face. Your skin type may also vary in different parts of your face, with some areas being oily, some being dry and some being sensitive. In addition to all of that, you may also have specific skin concerns, whether this may be acne, hyperpigmentation, or flaky skin, on certain parts of your face that you need to target. When you take all of this into consideration, you can easily see why one single mask is not able to give your skin exactly what it needs. The technique involves making use of two or more face masks at the same time. Of course, you could also always use a combination of the two! It is completely up to you how many masks you choose to use when multi-masking. While some may opt for just two, others go all out with five or six. 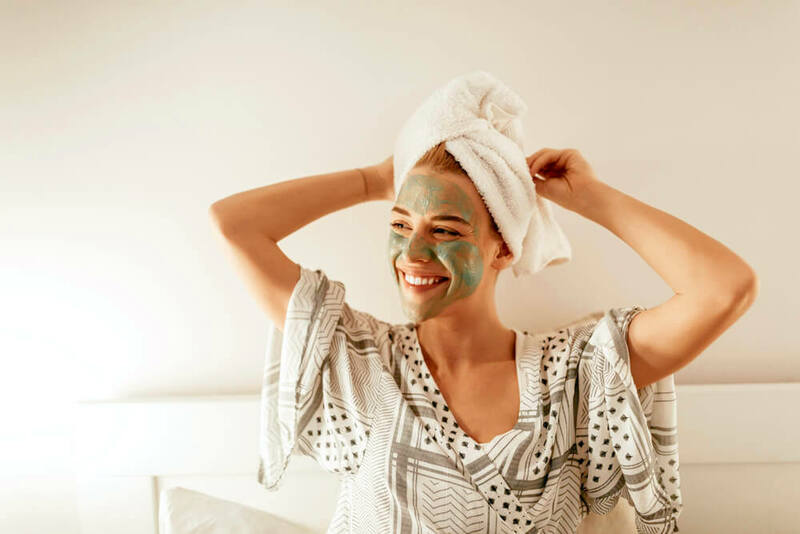 Clay masks tend to be the best for oily areas, because not only do they absorb any excess oil from your skin, as well as from deep within your pores, but they also draw out toxins and bacteria as well. Charcoal masks work in a similar way to clay, absorbing any oil while helping the skin to detox. You should also keep a look out for anti-inflammatory ingredients in face masks if you often suffer from acne. Give willow bark, yarrow essential oil and tea tree oil a try. Moisturizing and hydrating masks are fantastic for the drier areas of your face. These will contain a variety of ingredients that will work their way deep into your skin, giving it an intense dose of moisture. Dry areas benefit from both zoning and layering multi-masking. By layering masks just over dry areas, you give them that extra bit of moisture, without clogging up the pores on other parts of the face. As you age, you will likely notice that some parts of your skin show signs of this, while others stay quite fresh and youthful. It is important to include your entire face, as well as your neck and chest, when using anti-aging products. However, if your face mask contains quite potent anti-aging ingredients, you may want to focus this on your areas of most concern. For many, this would include the skin around the eyes and mouth, as well as possibly the forehead. Which anti-aging ingredients are most potent? As mentioned above, the skin around the eyes is so much more delicate than the skin on the rest of the face. In fact, many face masks will state “do not use around the eyes” for this exact reason. 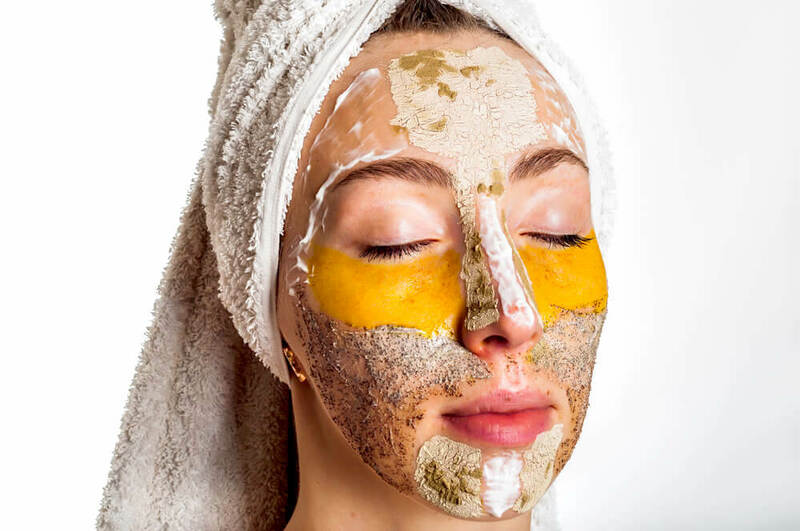 Fortunately, there are many face masks designed specifically for the eye area, while those designed for sensitive, or even dry, skin may be gentle enough to use around the eyes. Dark spots are something that you will likely experience only on small areas of your face, making multi-masking a great way to tackle them. The masks can be used almost like a spot treatment, after which you could then apply other masks either over or around it. Now that you have chosen which face masks your skin needs, you are ready to give multi-masking a try. Begin by preparing your face for the masks. By cleansing gently, before exfoliating. It is if you want your face masks to really work to their full potential. Cleansing and exfoliating will remove the oil, dirt, bacteria and more from deep within your pores. If you leave these in, the ingredients within your face mask will not be able to properly penetrate your skin, therefore minimizing their effects. Follow up the exfoliation with a facial steaming. If you are using an oil-absorbing, detoxifying mask, use these first. These are usually applied to the forehead, chin and nose, as these tend to be the areas most susceptible to excess oil and acne. Simply smooth on an even layer to your chosen areas. Next up, apply any hydrating or firming masks. These will usually have a texture similar to a lotion or cream, and can easily be rubbed on to the skin. Want to layer your masks as well? This is the point at which you would do that, but make sure that you have waited for around five minutes after applying the first mask. All you need to do is apply the second mask over the first, but keep in mind that the ingredients in the second layer would now be diluted down. Nevertheless, this second layer does still give your skin additional benefits, but only really works with masks that have a lotion or serum texture, rather than masks that dry on the skin. Now it is time to apply eye and lip patches. They are masks that are shaped in order to suit a particular part of the face, such as the area underneath the eyes, or over the lips. These patches form a seal between the mask and the environment, preventing ingredients from evaporating out and forcing them deep down into your skin instead. How long do you need to leave these masks on for? Usually about 15 to 20 minutes. However, each mask will come with its own set of instructions, and these will say how long a mask should be left on for. If you have one mask that needs to stay on for longer than another, apply that one first, before following it up with the shorter time mask a little later. This ensures that you will be able to remove the masks at the same time. With most masks, you will be able to just use water to thoroughly rinse the mask off your skin. But this can sometimes prove a little trickier with mud or clay masks, as these can dry quite thickly over the skin. Simply expose your face to steam, whether this may be a hot towel draped over your face or holding your face over a bowl of hot water, for about a minute. After this, you will find that the mask will be so much easier to wash off with water. Once you have washed your masks off, always follow this up with a layer of moisturizer. This will give your skin some extra protection and nourishment, and will enable the ingredients from your mask to have an even greater effect. As mentioned above, the skin on the neck is just as delicate as the skin on the rest of the face, but many people tend to neglect this area when it comes to skin care. If you don’t properly care for the skin on your neck, expect to see fine lines, wrinkles and loose skin far earlier than you otherwise would have. To avoid all of this, keep your neck in mind when multi-masking. You will likely not need to use any oily skin masks on your neck, as this area already tends to be drier. Because it contains fewer sebaceous glands, which are the glands that produce the oil to keep your skin moisturized. Instead, go for hydrating and moisturizing masks, as well as anti-aging ones. Just like when it comes to rinsing the masks off your face, do the same with the neck, and follow this up with some moisturizer too. Multi-masking is a fun and easy way to give your skin some customized TLC. No matter your skin type, or the skin issues you may be dealing with, multi-masking is something that you can still have a go at. After all, you never know, this may end up becoming a regular part of your skin care routine once you notice the results. This entry was posted in Skin Care and tagged face mask, multi-masking, skin care, skin health, skin types, T-zone.